The following texts are lifted from my article written for BroadwayWorld.com Philippines. 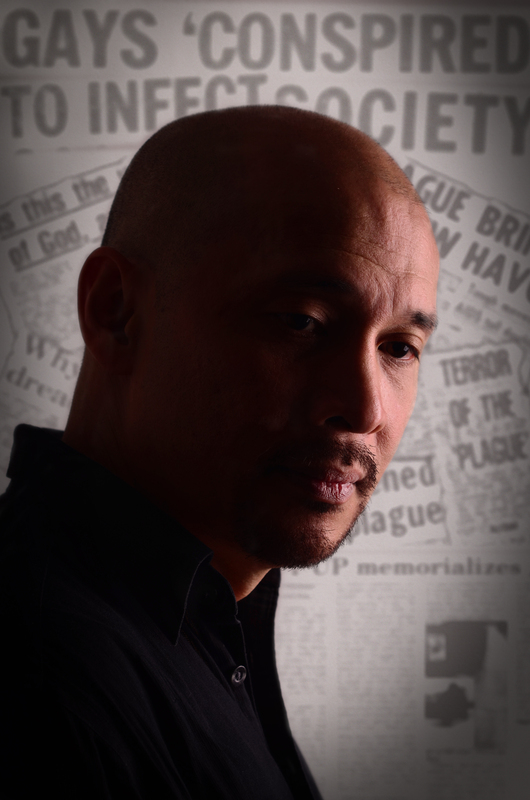 Bart Guingona is Ned Weeks in Larry Kramer’s ‘The Normal Heart’. Image courtesy of Actor’s Actors Inc./The Necessary Theatre. Manila, Philippines–The restaging of THE NORMAL HEART, produced by Actor’s Actors Inc./The Necessary Theatre, closes today at Carlos P. Romulo Auditorium, RCBC Plaza in Makati City. BroadwayWorld.com recently sat down with Bart Guingona, the play’s director and one of its lead actors who plays Ned Weeks, an activist in the fight against HIV/AIDS. The character of Weeks actually acts as the alter ego of Larry Kramer, the play’s author. In last year’s TV film adaptation of THE NORMAL HEART, directed by Ryan Murphy, American actor Mark Ruffalo played the role of Weeks. 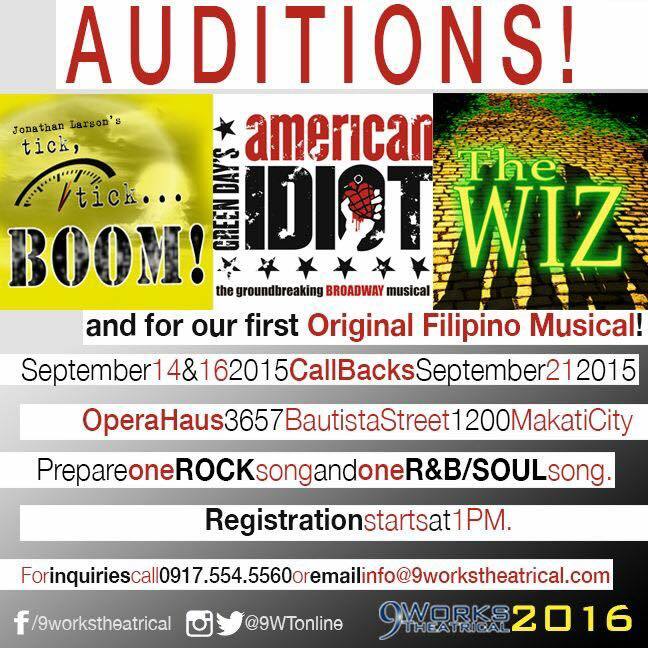 After successfully mounting its blockbuster shows for its 6th Season, 9 Works Theatrical is looking for bright, passionate actors who can sing and dance! The theater company produced ‘Grease’ and ‘La Cage Aux Folles’ will be mounting local productions of ‘Tick, Tick… Boom!’ by Rent’s Jonathan Larson, Green Day’s ‘American Idiot’, and the hit classic R&B musical—‘The Wiz’. Given the line-up of shows, Philippine theater won’t just be as exciting as ever, but will truly be awesome not just for theater aficionados, also for aspiring theater artists. Plus, the highly-successful theater group is also looking for the original cast members of its FIRST ORIGINAL FILIPINO MUSICAL! Prepare one ROCK song and one R&B/SOUL song! Bring sheet music or minus-one alongside résumé and a photograph. Registration starts at 1pm and closes at 5pm! 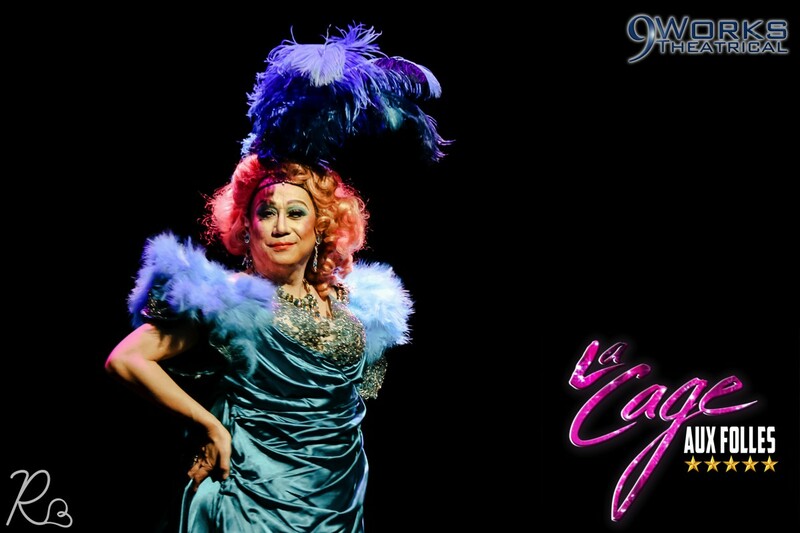 Two of the notable things the audience would definitely feast upon the local production of ‘La Cage Aux Folles’ are the costumes and the set designs involved as created by the genius of Mio Infante and is mounted in a rather more intimate venue at the Carlos P. Romulo Auditorium, which re-opened on the 15th of August. The Cagelles of ‘La Cage aux Folles’. Photograph courtesy of 9 Works Theatrical. Mio Infante, the scenographer of this latest 9 Works Theatrical’s production, the winner of Best Scenic Designs at Philstage Gawad Buhay Awards for his works—‘The Bluebird of Happiness (2013) and ‘Rak of Aegis’ (2014); talks about herculean tasks he has to accomplish along with his team in order to bring a show that won’t only be remembered because of its great lead actors—Michael De Mesa and Audie Gemora as Georges and Albin or Zaza, respectively. Mio Infante, the scenographer of this latest 9 Works Theatrical’s production. Photograph courtesy of 9 Works Theatrical. Through the ‘Beaded Eyelash’ of Albin. The colour palette of the show is very Mediterranean and is set in St.-Tropez is a coastal town on the French Riviera, in the Provence-Alpes-Côte d’Azur region of southeastern France. The place have been popular because of artists and attracted the international jetsetters in the 60s because of its beaches and the nightlife. 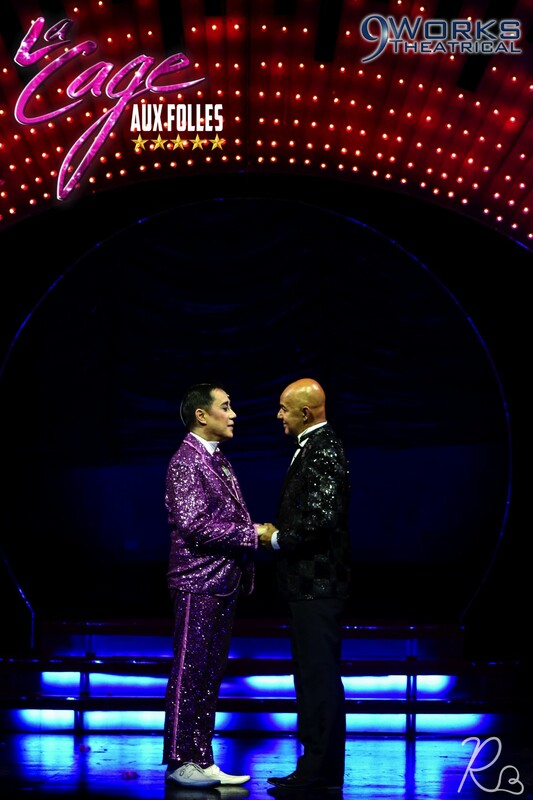 Audie Gemora as Albin or Zaza and Michael De Mesa as Georges. Photograph courtesy of 9 Works Theatrical. According to Infante, he borrowed inspirations from the golden hues of the skies and azure seas, the terracotta colors did find its way into the nostalgic ‘postcard look’ and ‘feel’ of a bygone era. The touches of teal and lavender echo the flora of the area. “Fitting a ‘big musical’ scene that changes into a small space as was quite challenging,” Mio confessed. In fact, his challenge didn’t end there since there it involves a thousand and one (quick) costumes, make-up and wig changes. Despite the fact that the originally show meant for a bigger theatrical venue, the director (Robbie Guevara) and him thought best to focus on the intimacy of the plot, that being about family, love and acceptance. When one looks at Albin’s beaded lashes, everything’s sparkle dust, bugle beads, ostrich plums as described in one of the songs titled—‘(A Little More) Mascara’ performed by Albin and the Cagelles as the world that he’s looking at is beautiful, too. “Albin is such a strong character. He is an artiste and can have his share of tantrums, despite the challenges of being accepted by the social norms, he ultimately can laugh about it, and selflessly take sidesteps in lieu of unconditional love for his family. He notes that he does this ‘with one great stroke of mascara’ and everything seems and looks better,” Infante added. With regard to their sets, Robbie Guevara (the director) and Mio agreed to retain the ‘look-and-feel’ of the 1983 original production, which had more froufrou, have lots of sequins and fabulous-ness as opposed to the Chocolate Menier Factory of the said musical in West End and as it transferred to Broadway. He also mentioned that the biggest challenge was the script as it required for multiple scenes that had took them inside the apartment, backstage of the club, on the St.-Tropez promenade and back; and the changes had to be fast and seamless. 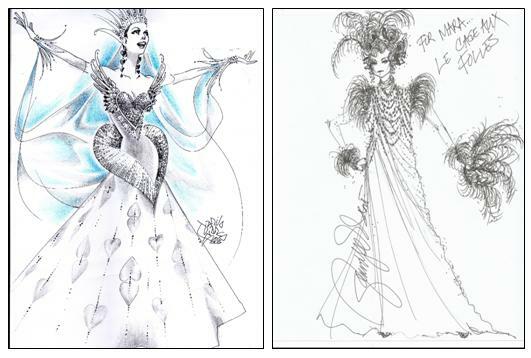 Designing Albin/Zaza’s costumes: A Dream Come True for Mio. Audie Gemora dazzles as Zaza in this scene. Photograph courtesy of 9 Works Theatrical. 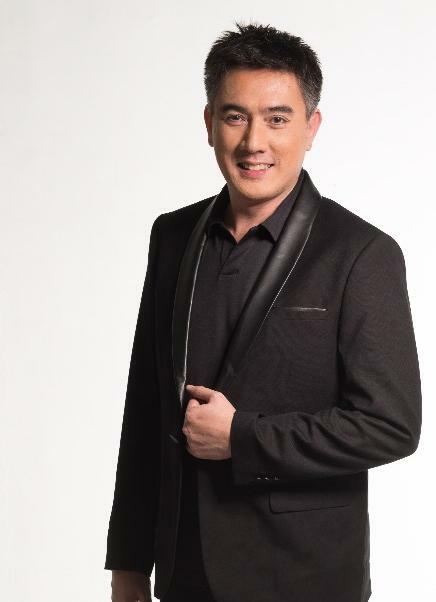 Infante who was a former Cagelle had Repertory Philippines’ 1988 production of the same musical, and second having designed the play version Gay Birds for Rep also in 2005 was a dream task. He shared that the work came easy for him since he’s already quite familiar. “We first see Albin ‘in-between scenes’, and ‘at home in the kitchen’, the script called for him in a dressing gown, but I figured her style offstage would still exude the flamboyant thespian style. He would be wearing a bustier and slip that would transform into a costume change in full view of the audience, but move well with the ‘Ginger Rogers-type of choreography’. Cagelles Dressed Fashionably in Drag. “We were very lucky to have been given permission to rummage through Repertory Philippines’ costume collection and (thank you to Tita Baby Barredo). It was fun and nostalgic to see costumes from shows I had been part of before as designer or as an actor. I remember finding a pair of Leopard hi-heeled boots and finding my name scribbled inside it! It was from the 1988 Rep ‘La Cage’ production. Wedding gowns by designers John Abul and Lito Perez are worn by Cagelles Rafa and Mako. 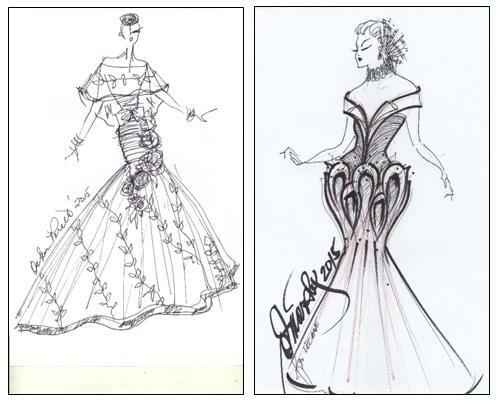 Sketches courtesy of the mentioned designers. Wedding gowns by designers Danilo Franco and Fanny Serrano are worn by Cagelles Randi and Mara. 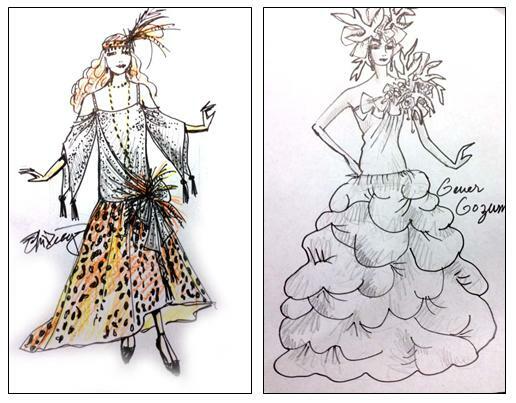 Sketches courtesy of the mentioned designers. Wedding gowns by designers Oscar Peralta and Ole Morabe are worn by Cagelles Analin and Chesko. Sketches courtesy of the mentioned designers. Wedding gowns by designers Edgar San Diego and Gener Gozum. 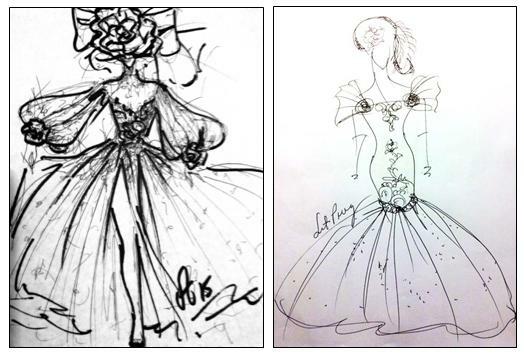 Sketches courtesy by the mentioned designers. Other costume designers like Tita Celia Diaz Laurel, Tita Baby, etc. We borrowed costumes for Jacobs’ quick costume changes. While on the wig and make-up, Mio collaborated with the talented Myrene Santos. We went through on different wigs that would flatter the male actors’ faces, keeping with period style, and budgets. We also have female actors in the Cagelle line-up, and it added a challenge to make them look like men in drag—costume and make-up wise. 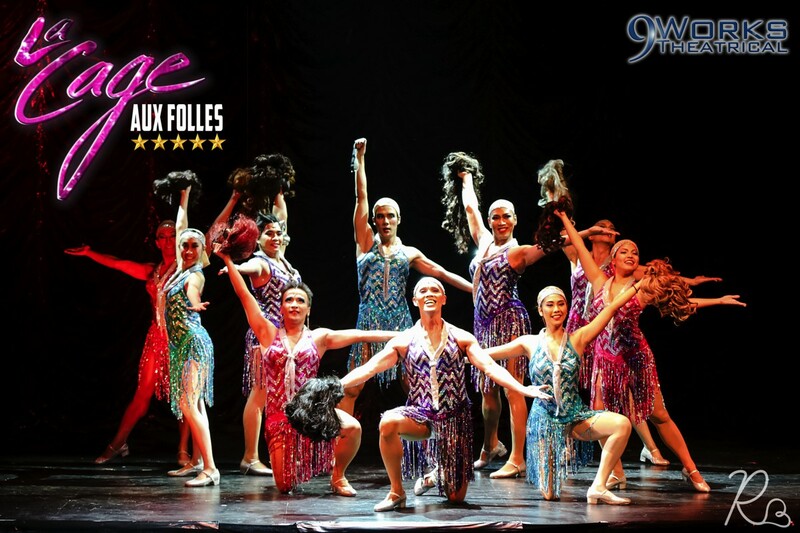 ‘La Cage Aux Folles’ will have its last show today, September 6 at 4pm. For tickets and other inquiries, call (632) 586-7105 or +639175545560, or email info@9workstheatrical.com.